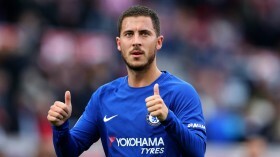 Chelsea manager Maurizio Sarri has indicated that the club won't come in the way of Eden Hazard, should he seek a fresh challenge at the end of the ongoing campaign. The Belgium international has just 18 months remaining on his existing deal with the club and this has increased concerns regarding his future with Real Madrid speculated to be interested in him. Speaking ahead of the Premier League clash against Bournemouth, Sarri highlighted that Hazard's situation is quite different from Callum Hudson-Odoi's, given the latter is only at the beginning of his professional career. He added that the Belgian is free to part ways with the club in the summer, although there remains the hope that he will eventually commit his long-term future to the club. The 28-year-old has contributed 10 goals and 10 assists in the Premier League this term and he looks on course to experience his best campaign since joining the west London side more than six years ago.